Frank Colver wrote: I'm locked in to USHPA if for no other reason than to maintain my member number 7. You should keep it forever. It gives you the credibility to remind USHPA how far they've strayed. Frank Colver wrote: I have also tried, as a member, to get the org to change membership rules (no success). USHPA's use of politics to deny insurance to people they don't like will come back to bite them. Governments will have a hard time justifying required membership in such organizations to use public property. USHPA is shooting themselves in the foot ... yet again. I would like to apply for a H4 with the US Hawks based on my USHPA H4 rating. Your rating has been verified and issued. Thanks for joining the US Hawks!!! All the talk elsewhere about US Hawks Rating cards has caused me to FINALLY REMEMBER to apply for my own US Hawks Rating! Of course, doing this eliminates my "I wonder who wingspan33 really is?" status. But I'd guess that almost anyone could find that out with a little research right here on the US Hawks. Lapsed USHPA member # 20437 since March of 2013. Started flying in May 1975, over 41 years ago. Joined the (almost new) USHGA in 1977. My name is Gary Trudeau. I am and have been a USHPA member (62543) since the early 1990. 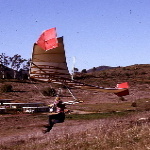 I currently hold both a hang gliding (H4) and paragliding (P3) rating. I would like to submit the rating information for consideration for a USHawks rating. Below is my current information from my USHPA membership. Thanks for considering me for a USHawks rating. Your rating has been verified.